They arrive. Earth's first alien encounter begins when huge motherships appear over 29 major cities. The visitors ? the Vs ? are human-like beings who know our languages and bring awesome gifts of healing and technology. People everywhere welcome them as saviors. But a fledgling resistance is on the rise, determined to reveal the shocking truth. Among the underground cadre: an FBI Counter Terrorism Agent who uncovers a terror cell no one ever expected?and finds that her teenage son is drawn to the beauty and promise of the Vs.
Download V in Digital HD from the iTunes store. V images are © Warner Bros.. All Rights Reserved. For many, many years now Hollywood has been going back in time to remake films and TV shows for new audiences. Sometimes this works out but as most of you know that isn't always the case. 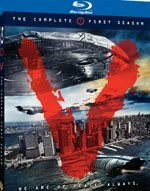 The newest TV show to get the 21st century update is V, which originally aired in the 80's as a mini-series and went on to become a short lived television show. Last year ABC decided to revamp that series and present it to new audiences. The show centers on a civilization of aliens, known as the V, who arrive on Earth via very large space ships and claim to have come in peace. They offer knowledge in exchange for "a common mineral found on our planet". Of course as time passes and people see how advanced their knowledge is and how much we can benefit from it, the majority of humans see the V as a miracle from the heavens. As we watch though, we see that the V have something else in mind for our little blue planet and what that is exactly we have yet to find out. 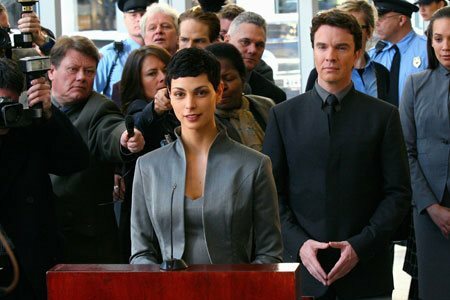 Anna, played by Morena Baccarin, is the leader of the V and she plays the part quite well. Her character is at warm and compassionate in front of the cameras but behind them displays the utmost cruelty and heartlessness. Erica Evans (Elizabeth Mitchell) is an FBI agent who is uncertain what to make of the V's. Her son, played by Logan Huffman thinks the V's are the coolest thing ever, and of course it doesn't hurt that he has a crush on one of them. Morris Chestnut plays an ex-V who was sent to Earth as an advance scout to learn our weaknesses for when they finally arrived. Now, with the help of Agent Evans and some others they lead a small resistance cell set on exposing the V's for what they truly are. The show itself does a good job of setting up the mystery of what the V's want with us. According to ABC the show is getting ready to start its second season soon and we should expect more action and bigger reveals in terms of plot. This might be a relief to some fans who felt the show was a bit slow in terms of pacing and plot development. Most episodes left you feeling like nothing really happened other than the characters talking about how they need to "show the world what the V's are really like". Now the show has comes to Blue-ray and for any fan of the show this should be a moment of excitement. The DVD comes packed with lots of extras to whet your appetite for the upcoming season. To list just a few, we have: The World of V, The Actors Journey from Human to V, The Make-up of V, and a look at the visual effects for the show. Obviously a good amount of time and effort went into the production of this DVD, which is always nice to see for any fan. As far as the upcoming season and what it may mean for our characters, only time will tell but for those of you who enjoy sci-fi and a decent mystery than you should check out V.
V images © Warner Bros.. All Rights Reserved.